Our credit union is committed to providing a website that is accessible to the widest possible audience in accordance with ADA standards and guidelines. If for some reason, you are using a screen reader or other auxiliary aid and are having problems using this website, please contact our Operations Coordinator at 937-767-7377. All products and services available on this website are also available at all of our branches. If you need more personal assistance in reviewing what we have to offer or taking advantage of our products and services, and prefer not to visit one of our branches, just give our Operations Coordinator a call. She is happy to talk with you to ensure that you can learn about and take advantage of all the products and services we offer. Instructions for accessing your accounts after system upgrade. 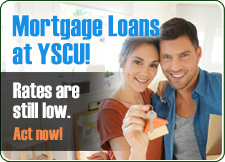 NCUA - This Credit Union is federally-insured by the National Credit Union Administration.